People to the political right have been criticizing President Obama for an omission of "by their Creator" from a political speech in which he quoted the Declaration of Independence. President Obama's supporters dismissed the omission as either a "distraction" or a teleprompter malfunction. Indyposted.com reports tha tunfortunately for Obama's apologists, Obama made the same mistake on September 22, when he left the words "Under G-d" from a Gettysburg Address reference in a speech in Washington. Ominously, what had once been only an omission from a speech has now crept into print. Indyposted notes as follows. 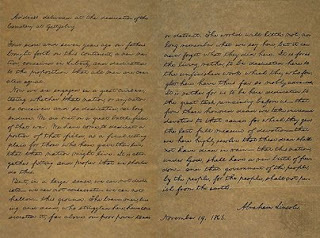 Despite that, there is, according to World Net Daily an organization called the American Constitution Society for Law and Policy that puts out a pocket size pamphlet that can be downloaded as a pdf file that contains the Declaration of Independence, the Gettysburg Address and the Constitution. 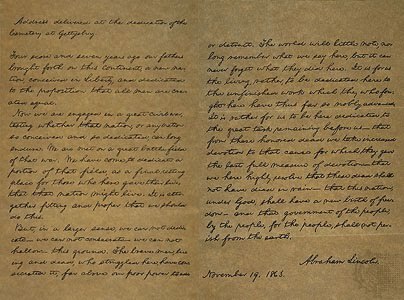 In print, the pamphlet has the critical words “Under “G-d” omitted from the speech, above which is noted “The Hay Draft.” This is despite the opinion of scholars that the speech given at Gettysburg did in fact contain the omitted reference to the Creator. What's the big deal? Are people trying to make Obama look bad? There is a critical distinction between rights that are bestowed by the government and rights that are G-d given. There is a fundamental difference between rights that are sacred an inalienable and rights that are determined by a Higher Being. The phrases "under G-d" and "by their Creator" put elected officials on notice that they must answer to G-d, and that they are not gods themselves. In a synagogue, when the Torah is read, if the reader mispronounces a word, corrections are loudly called out until the reader backtracks and corrects himself. If even a single letter is found to be miswritten, the Torah scroll is put away and the reading continues if possible from another scroll. It is jarring to witness. The sight of corrections being loudly called out almost seems rude. But that is what keeps errors from creeping into the Torah, what assueres that the same text unites all congregations. It keeps things real. America is united by founding documents. It is entirely fitting that the original text of the documents that define and guide us be zealously guarded and not misquoted. When I hear people calling out their protest against the omission of "our Creator" from the text, it seems totally proper and vitally necessary to our unity as a nation.